Ever wanted to learn how to repair netbooks and laptops? I'm sure you already know that laptops and netbooks are mainstream; they are used by everyone. Can you imagine all the money you could make if you knew how to fix them? What about starting a profitable laptop repair business? As a matter of fact, many are already earning huge amounts of money by repairing laptops! Find a job with a laptop repairing company to gain a few years of experience - and change your current job for the sake of gaining experience. Sit for laptop repair classes that cost a few hundred dollars per sessions - and wasting hundreds of dollars which is not very convenient or cost effective! I'll tell you why - it works like clockwork; the more difficult learning how to repair laptops is, the more the demand for such skill; and therefore the greater the monetary rewards for those lucky enough who know how to do it. Furthermore, in the current economic climate, the demand for laptop repair has skyrocketed, as people are less likely to go and buy a new laptop just because their current one is having problems. But who am I to know how to repair laptops? Well, not only am I a technician but I've also made a "fortune" over the past 15 years by repairing laptops. Note that my video series is NOT your normal, everyday YouTube videos. You will get hours of professional high definition (HD) videos created by seasoned laptop repair technicians as well as step-by-step training guides. Sooner or later, every person you know (and everybody they know) will have laptop problems. So, why not be their go-to guy for their laptop repairs. You'll have hundreds of customers your way...which means thousands of dollars in your pocket! Many people are making a fortune by buying faulty laptops for just a few dollars (just do a search on ebay for 'faulty laptops'...go on, ebay it! ); repairing them, and then selling them for 300-500%+ profit! I know, because I've made chunks of money that way too! Start your own successful laptop repair business that'll never run out of desperate customers. Be able to relax when your own laptop breaks down because you'll know exactly how to fix the problem. Start making money right away by repairing broken down laptops (that can be bought for near to nothing) and selling them for a massive profit. See your profits explode because I'll tell you exactly where I buy all my supplies for a fraction of their retail price. CD/DVD Drives - info, repair and replacing. Batteries - all about batteries and how to find replacements cheaply. Tools and Accessories - for repairing laptops faster. Motherboards - info, repair and replacement. Memory - info, adding memory and finding replacements parts. Hard Drives - all about hard disks and how to replace them. THOUSANDS of people have already successfully learned how to repair laptops with Laptop Repair Made Easy™! "The videos were amazing and I learnt quickly..."
"A few weeks ago my brother brought home three faulty laptops that his office was going to throw away, and he asked me if I knew anyone to sell the parts to. While searching online about how to monetize faulty laptops, I stumbled across your site and ended up purchasing Laptop Repair Made Easy. The videos were amazing and I learnt quickly because I had three laptops on which to practice. To my amazement, I actually managed to get all three of them working again, and it didn't take me that long either. A few days later I sold them to a second hand computer shop and the profit margin is just superb! I have now bought ten faulty laptops from eBay and will get to work on them soon. This is so easy money!! " "I'm truly impressed both with the quality of the information provided and the quality of the videos..."
"Thomas, I have just finished watching the videos and I want to let you know that I'm truly impressed both with the quality of the information provided and the quality of the videos. You thoroughly explained how to diagnose the problem and solve practically anything that can go wrong with laptops, and the information is provided in an easy to understand, plain English format. I'm a very happy customer and will recommend your system to all my colleagues." "I highly recommend this system to everyone..."
"You've just saved me loads of money! My laptop got messed up for the n th time and when the guys at the tech store told me it was gonna cost me $120, I knew I needed an alternative. I'm reading for a degree in history, so I don't have any background in electronics, but your site promised that everyone would be successful with your course so I bought it. You were right, I found the videos and instructions extremely easy to understand and I got my laptop working like new! I highly recommend this system to everyone but especially to students who often overwork their laptops and have no money to pay for regular repairs!" "I am making almost four times the money I was making before..."
"I quit my job, thanks to Laptop Repair Made Easy! You see, up to last year I was working as a shop assistant and I hated it. Then I read about your course on a DIY forum, and it was the best investment I have ever made. I am now repairing laptops full time, and best of all I am my own boss. I am making almost four times the money I was making before, and I don't get shouted at if I don't start at 7am sharp. Last month I went on holiday for two weeks and it felt good to have the money for it and not having to plead with my boss to give me time off. Thank you Thomas." "I've thought myself how to repair all kinds of laptop problems in less than two weeks..."
"I've thought myself how to repair all kinds of laptop problems in less than two weeks using only Laptop Repair Made Easy, so I felt that I owed you a thank you email. I was never a handy person but the videos made learning easy and they made me feel like I was standing beside you while you repaired the laptops. I've already repaired some friends' laptops (acers and hps) and now I'll be posting an ad in the local newspaper to advertise my services. " "The videos are excellent and they explain the procedures extremely well." "I don't usually write about products I buy, but I felt compelled to send you an appreciation email about Laptop Repair Made Easy. For the small price I paid, I wasn't expecting such a top notch resource. The videos are excellent and they explain the procedures extremely well. The guide is very well written and even someone with zero background in the topic will have no problem understanding the information. I've only fixed my own laptop so far (motherboard issue) but I'm confident I could deal with any laptop problem that may crop up. Your product is worth its weight in gold!" "I can't believe how much I was getting ripped off every time I took my laptop for repairs!" "I can't believe how much I was getting ripped off every time I took my laptop for repairs!! 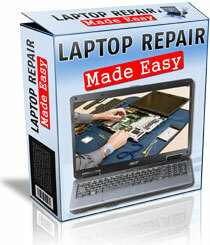 Laptop Repair Made Easy has showed me that the work involved is minimal and it doesn't require any special skill. And all parts can be bought for just a few bucks online or in hardware stores. Really, I can't believe I've paid $50 to over $150 for previous repairsâ€¦never again!" "I buy faulty laptops for just a few bucks, repair them, and sell them for 400-500% profit..."
"I'm a top rated seller on ebay making a fortune selling second hand laptops. Basically, I buy faulty laptops for just a few bucks, repair them, and sell them for 400-500% profit. The ironic part is that I've never took a computer repair class in my entire life. And I've never even worked in electronics before (my previous job was at a call center for a bank). BUT I was keen to improve my financial situation and with Laptop Repair Made Easy, I found the answer. I am now working from home and I'm making much more than I was doing before. I'll also be getting married in a few months and life can't get any better!" Laptop Repair Made Easy™ covers from the very basics to the most advanced laptop repair techniques. For both PC's, Mac's and Netbooks! The best part about "Laptop Repair Made Easy™" is that with just one laptop repair, you'll make back your entire investment. So essentially, Laptop Repair Made Easy™ will pay for itself after repairing a single laptop! If for any reason, Laptop Repair Made Easy™ does not live up to your expectations, simply contact me within 60 days of your order date for a full refund, no questions asked. Order Laptop Repair Made Easy™ Now! Laptop Repair Made Easy™ will show you exactly how to repair laptops at home: with the help of step-by-step guides and videos. Laptop Repair Made Easy™ is in digital format (PDF & Video) which means there is no need to wait for it to arrive. You'll be get started in just minutes from now. P.P.S. 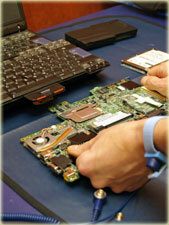 : Remember that you will get your investment back after your very first laptop repair. It can't get any better! ClickBank is a registered trademark of Keynetics Inc., a Delaware corporation. LaptopRepairMadeEasy.com is not affiliated with Keynetics Inc. in any way, nor does Keynetics Inc. sponsoror approve any LaptopRepairMadeEasy.com product. Keynetics Inc. expresses no opinion as to the correctness of any of the statements made by LaptopRepairMadeEasy.com in the materials on this Web page.